My favorite vehicle the museum had on display had to be the WWII White M3 Halftrack. It was very complete and restored to a very high standard. The tracks looked close to brand new and considering they run a couple grand for each side today it must have been a costly restoration. The WWI M1917 light tank (A US built licensed version of the French Renault tank that served so successfully in WWI) was also extremely well restored and I love the blue/brown/sand camouflage paint scheme. 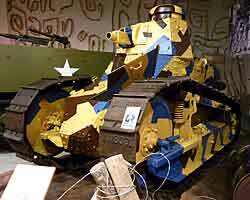 It is stated to be the last remaining M1917 tank that was configured to carry the Marlin air cooled machine gun. The museum has a Marlin Machine gun on display that gives a clear view of the cooling fins that surround the gun barrel. 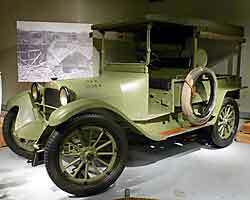 Indoors you will also find a fairly rare Bantam Jeep, an earlier version produced before the flat fender style jeep was standardized a Dodge 1918 Light Repair Truck , and a General Motors K16 Ambulance, also from the first World War. 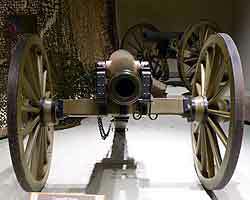 The Pennsylvania Military Museum also has a nice collection of small arms. 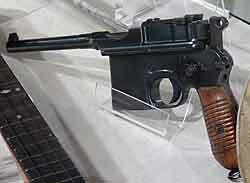 The weapons on display include a fairly rare WWI German Luger Artillery model with an 8" barrel. 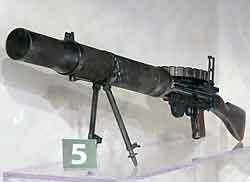 Their Reising Submachine Gun is also rare, and the German WWI flamethrower is especially unique. 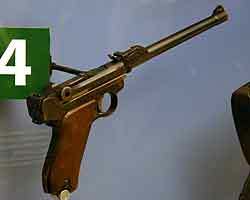 There are also more familiar weapons such as the Thompson Submachine Gun, M1 Garand, M14 and M16 semiautomatic rifles. Also on hand were a US WWI Bazooka, and the German WWII Panzerschreck, the German's answer to the bazooka which added a blast shield for the operator and used larger diameter and heavier rocket propelled projectiles for better armor penetration than what the Americans fielded. There was also a WWII Springfield sniper rifle, complete with scope. It was the first I'd seen in a museum, and the first Springfield I'd seen without iron sights on the barrel. A predecessor to the M113 APC, the M59 Armored Personnel Carrier was also on display and in fairly good shape. Outside the museum you'll find 2 fourteen inch naval gun barrels from the battleship USS Pennsylvania. The gun barrels are over 70 tons each and very impressive. 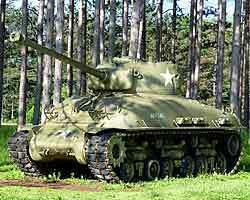 In a wooded area alongside the parking lot is a late version Sherman tank. It is a great setting but the elements have not been kind to the Sherman and the paint is peeling and rust is beginning to take hold. 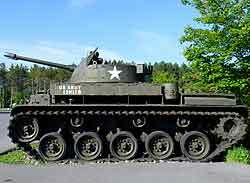 An M59 Armored Personnel Carrier next to the parking lot is in much better shape, and an M60A3 US Army Tank positioned outside the museum looks just great. Also on the museum grounds is a memorial wall and other monuments honoring Pennsylvanians who served and died serving our country. Within the memorial grounds close to the bridge is a German WWI 7.7cm Feldcannone 96nA, a captured field cannon from the first World War. The tours are self guided and the only staff I saw that weekday were at the ticket desk and the gift shop area. There is a slight slope leading up to the museum doors and there are steps but there is handicap parking next to the rear of the museum so the facility is very handicap accessible. Most of the memorial wall area is flat or ramped but there are some stairs to get to the upper level. There was no food on site and no fast food places I could see between the highway and the museum, but the town of Boalsburgh was just a couple of miles away and did have some places to eat. There also were some benches around the parking lot and memorial area if you wanted to bring your own lunch. 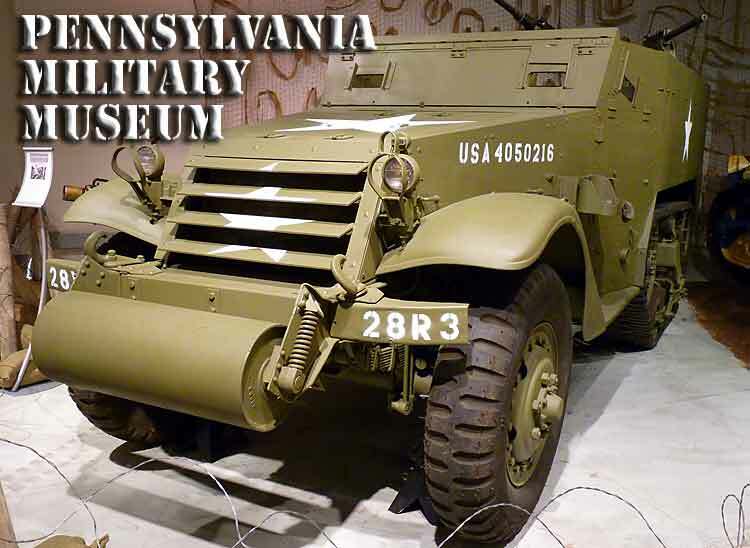 Visit the Pennsylvania Military Museum Website for hours and directions. 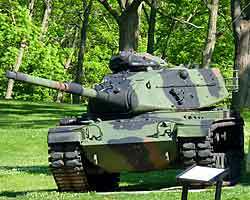 This website is not affiliated with the Pennsylvania Military Museum.